Cement manufacturing as a process and as a core industry has undergone many stages of transformation in recent years. SEFTECH holds deep domain knowledge of the industry and hence, is equipped to offer customized services that can meet the needs of clients for Rotary Kiln Cement Plants, Vertical Shaft Cement Plants, Clinker Grinding Units, Slag Cement Grinding Units and Slag Grinding Project. Recently, SEFTECH & it’s associates executed a cement project on turnkey basis in Djibouti, Africa. 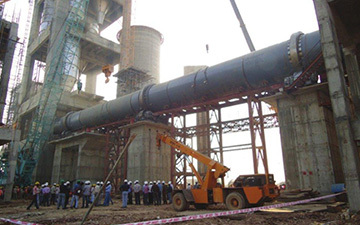 Key Cement Plant components manufactured from plant of seftech’s group associates have been delivered to many cement Plant Suppliers in the country through other reputed suppliers such as Humboldt Wedag, FL Smidth, L&T and Jai Prakash Associates Ltd etc . for their clients like Shree Cement, Orient Cement, Diamond Cement, Ultratech Cement, Dalmia Cement, UTCL Aditya, Ambuja Cement & Birla cement Satna etc.